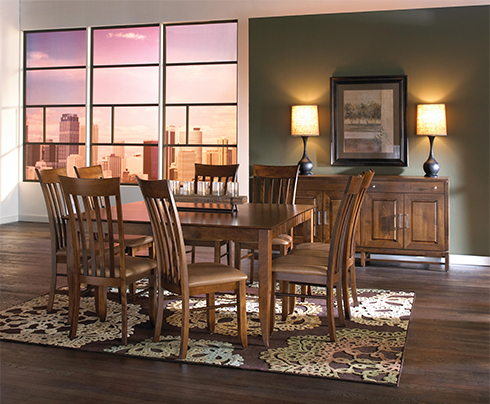 Be sure to leave enough space for comfortable traffic flow throughout your dining room. A good rule of thumb is to leave 42 to 48 inches between the edge of your table and the wall (or dining buffet, china cabinet, etc.). By ensuring that there's enough space around your table, you'll also create a good proportion of table to room size. Be cognizant of seating space for each guest! This will depend upon the table design and chair size. Take a look at the table's legs - sometimes a unique table may be your favorite design but the legs are placed in an odd location and can be chunky, taking up space of your chair. Pedestals will allow for extra space and extra leg room for guests. As a general guideline, leave between 24 and 30 inches per chair - and don't forget enough space at each end if you'll have a host and hostess chair at the ends. For a general guideline, take a look at this chart to see how many chairs a dining table should fit. Dealing with a small dining space? Choose a round table! They typically allow for a better traffic flow and more seating in a smaller space. Trying to fill a large space? Choose a square table! It will help fill out the space and make it feel more intimate. Need a versatile size? Choose a table with additional leaves! This will allow for the perfect sized table for day to day dining and an extended table for holidays and occasions with friends and family. For more design tips, ideas, and inspiration visit Belfort Furniture's showrooms in Dulles, Virginia. Conveniently located outside of Washington DC, Belfort offers hundreds of room settings and experienced professionals here to help solve your design dilemmas.